Sporadic Sentinel: Best Week 17 Ever? There's only one team that's in the NFL playoffs whose playoff life cannot be changed no matter what happens this week, and that's the Kansas City Chiefs. They're the AFC five seed. That's a lock. And that means that 11 other playoff spots are up for grabs. I can't remember going into the final week of the season with 11 playoff spots yet to be determined. I've complained a lot about the NFL and their goal of “parity.” I've always heard that to mean that they want every team to finish 8-8, which to me means they want everybody to be “average.” Now, if they really mean that they want 11 playoff spots to be figured out on the last week of the season.... well, I'm in. This could be the best week of regular season football ever. I mean, the games themselves might not be that great, but there's more at stake than there has ever been in one day of professional football. At least since the very early days, when the league's future hung in the balance, but I'm getting a little too far off the field. You know what I'm saying here. Consider that no division in the NFC has been settled. Even for the teams who are already a guaranteed a playoff spot, their playoff lives have yet to be determined.. 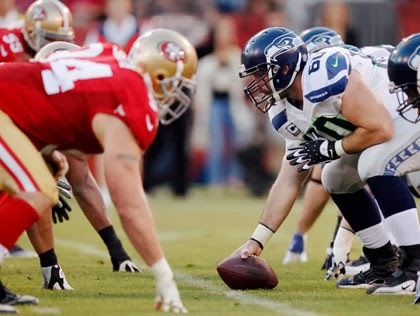 The Seattle Seahawks, the consensus front-runner for the Super Bowl, could be the one seed, the five seed, or the six seed. Same with my chosen favorite team, the San Francisco 49ers. The Carolina Panthers could be the two, the five, or the six. And those are the teams that are in the playoffs. It gets goofier for the rest of them. The New Orleans Saints, a Super Bowl favorite for many during the season, could be the two seed and get a bye, or they could miss the playoffs entirely. The Arizona Cardinals have already won ten games and they could still miss the playoffs. They are hosting the 49ers. It's worth noting that if they beat the 49ers, the Cardinals still aren't necessarily in the playoffs, even with 11 wins. Because their future depends on the outcome of not only that game, but the Saints game and the Panthers game as well. And as has been mentioned in many places this past week, the schedule-makers outdid themselves with week 17 matchups between Green Bay and Chicago, and Philadelphia and Dallas. The winner of those two games wins their respective division and hosts a playoff game next week, the loser is done for. And those winners could host the Seahawks, the 49ers, the Saints, the Panthers, or the Cardinals. After the Chiefs, the AFC picture seems easier to figure out, but that illusion is only at the top. The division winners are set. Denver is the number one seed. After that, it gets real murky real fast. The Patriots, Bengals and Colts could get the second seed and the bye or host next week. The Dolphins, Chargers, Ravens and Steelers could still make the playoffs. The Dolphins have the easiest road (win), the Steelers have the hardest (the other three lose and they win). It boggles my mind that the Chargers, who have been left for playoff dead about a thousand times this season, could still make the playoffs. 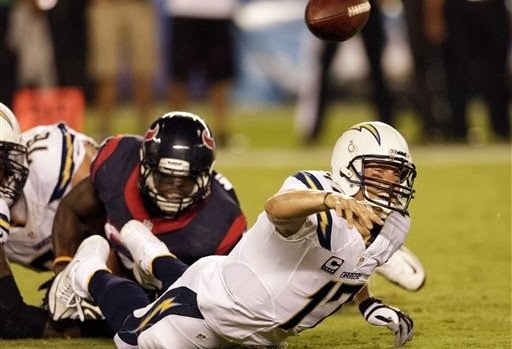 Consider that they could have wrapped up this playoff spot weeks ago had they not blown a huge lead to the 2-13 Houston Texas in week one, or actually scored a touchdown in the final seconds to win in the Capital against 3-12 Washington, instead of kicking a field goal and losing disastrously in overtime. The mind boggles. And that's not even considering that Miami is in the driver's seat, and they have had off-field distractions that would have destroyed pretty much any team's season. And as it happens, this week, the Miami game will be called on CBS by Greg Gumbel along with the one and only Dan Dierdorf, who is retiring as a color commentator after the season. I've no doubt he'll get to work a playoff game next week so this won't be his final goodbye, but it'll be one of the final chances to hear Dan call everybody brilliant. Since the other team is the New York Jets, Dan's praise will be even more-cringe worthy. But that's forgetting what Dan represents. When Dan steps out of the booth for that final time, Al Michaels will be the only broadcaster left from the glory days of Monday Night Football. There was a time, you may recall, when MNF was the only prime time football game on television. No Sunday night, no Thursday night... it was Monday or nothing, and the focus of the entire football-watching country was on that game. 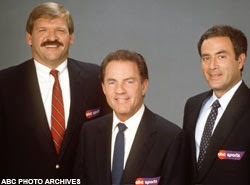 And with Michaels and Frank Gifford on two of the other microphones, the only way Dan Dierdorf was going to get any attention was if he over-praised a player or a play on the field. So he did. He was over-the-top. Giff and Michaels balanced him out. The problem was when Dan went from a three-man booth to a two-man booth, and kept that “how amazing is this three yard run we've all seen a zillion times,” thought process to his commentary. I have a plan to fix the three-man booth that's never really been implemented, but that's another column. 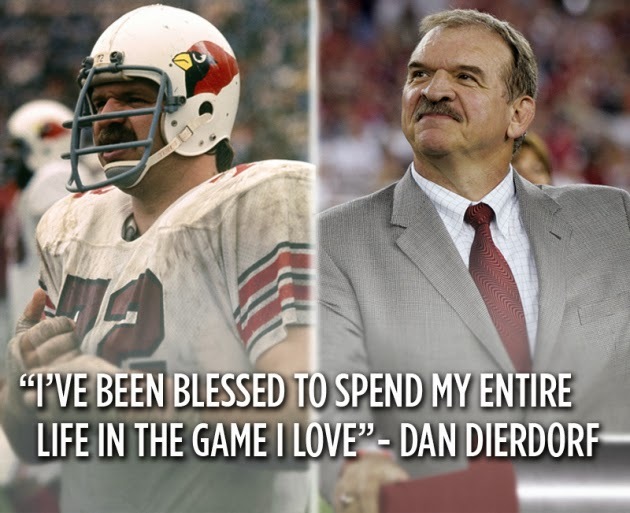 The other thing is that people are talking about Dierdorf like he'll never go to another football game again. The man is 64. What's he going to do, never leave his restaurant in St. Louis for the next 25 years? For Pete’s sake, Don Criqui, who must be in his mid 70's and has been retired from regular play-by-play for at least a decade, called a Patriots-Jets game for CBS this season. Dierdorf will quietly come back after a season off, if that. I guarantee it. Right now, the key is to enjoy Week 17. As Dierdorf might say, it could be the most amazing, stupendous, down-right fantastic week of the football we've ever seen in the National Football League.